Media and Contents: 67 tan coloured plastic parts on two sprues, 66 metallic grey plastic parts (L&L tracks) on one sprue, decals for four vehicles, a five page fold-out instruction sheet with history, parts plan, eleven photo type build diagrams and two pages of paint/decal instructions. 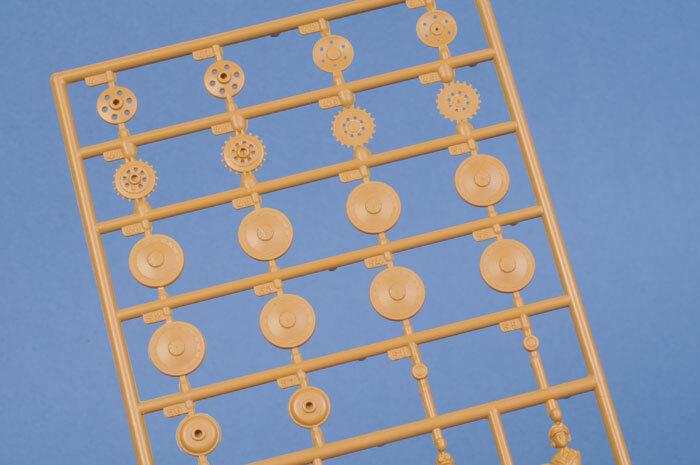 Advantages: One of Esci's better kits, link and length tracks, open hatches, two figures, reasonably good detail, excellent decals and colour schemes. Disadvantages: Some missed details (aerial mount and cleaning rods), photo type instructions (Yuck) and some minor dimensional problems. 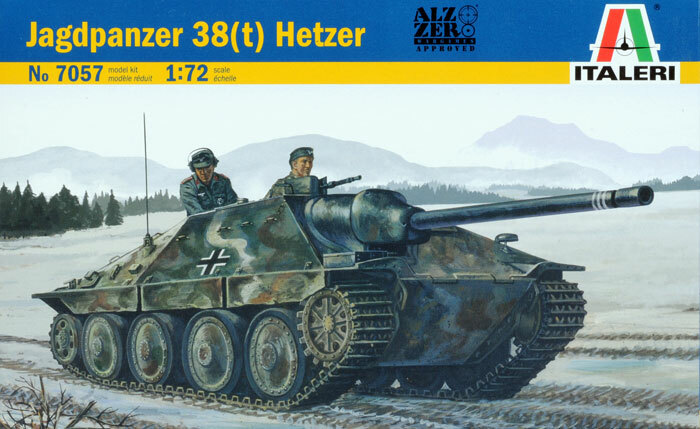 Recommendation: Although UM from the Ukraine has also produced the Hetzer in several versions and also in Braille, this one from Italeri will be easier to get and probably cheaper and will still build into an excellent model straight out of the box. Built in Czechoslovakia, the Hetzer was a small tank-hunter based on the Czech 38T tank's running gear. Its small size, low profile, maneuverability and ability to cross softer ground than most Allied Armour plus a powerful 75mm anti tank gun made it a worthy and well respected foe. 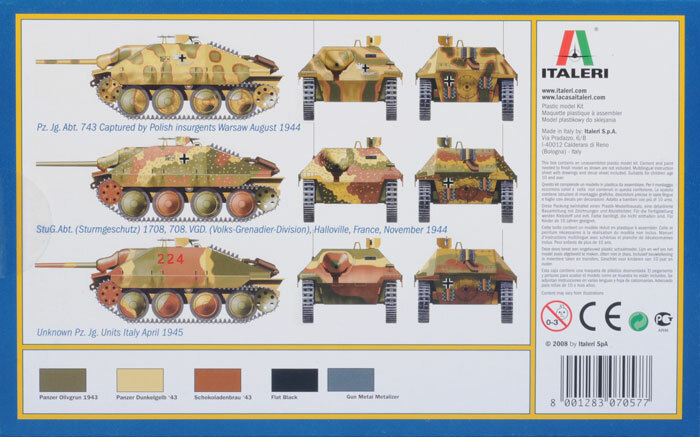 For the last couple of years, Italeri has been marketing the range of Esci 1/72nd scale armour. 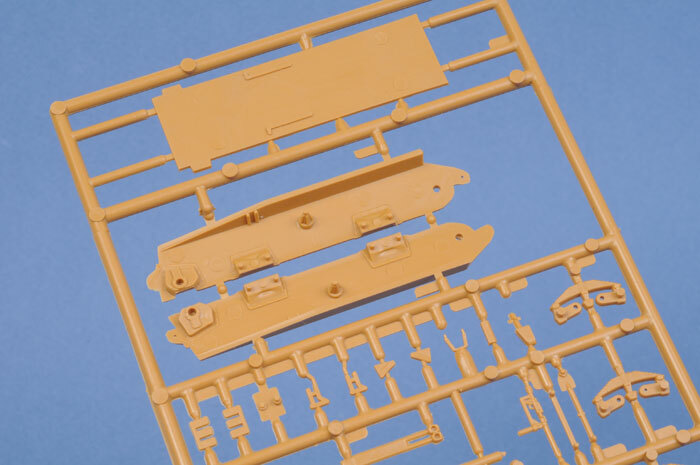 Initially, they were well received but gradually, other small scale companies have been producing the same vehicles with better detail making the Esci kits somewhat redundant. There are a few, however, which either because they were excellent kits to start with, or, are the only example available, are still up there with the best. 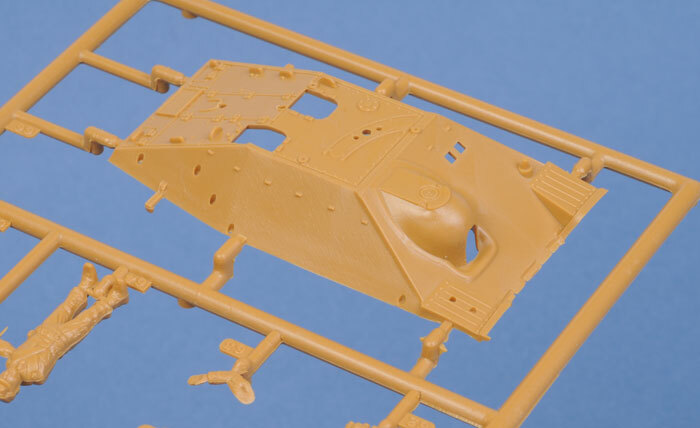 Esci's 1/72 scale Hetzer kit is one of those. Not perfect by any means but then, what is? It appears to be slightly narrow in width, the hatches are a little on the narrow side and some small details like radio aerial mount and cleaning rods seem to have been missed. On the plus side however, it has link and length tracks, open hatches, excellent detail, next to no flash and only a few small sink marks that most modellers will simply live with. Then there are the instructions. Oh dear, what was Mr Italeri thinking? Photo type build diagrams are just not good enough. Dragon tried it a while ago and quickly went back to there original although with a bit of colour to emphasize the point. Mirage are also giving it a go with similar results but I haven't seen their complete range so I don't know how wide spread it is. Please Mr Italeri, go back to your excellent line drawing type diagrams. Decals, as usual for Italeri, are very good with markings for four vehicles, perfect register and minimum carrier film. Three of the four schemes are on the back of the box in full colour but unfortunately they don't show the right or top view so you will have to guess as to the pattern. Version A. 94th Infantry Division, Italy, Spring 1945. A late production vehicle with green and brown wavy lines across the upper surfaces separated by narrow Dark Yellow lines. A very attractive scheme, often seen on Tiger Is and Jagdpanthers. Version B. A vehicle captured by Polish insurgents, Warsaw, August 1944. This ones in over-all Dark Yellow with blobs of red-brown and dark green borders, all hard edged. Version C. StuG.Abt. 1708, 708. VGDivision, Halloville, France, November 1944. This one in the classic three colour Ambush scheme that's almost synonymous with Hetzers. Version D. Unknown Pz. Jg. Unit, No location or time. Again in three colours with hard edges. My last and smallest gripe is the box art. It won't win Italeri any sales but it's better than some of the photos of badly built models that some model manufacturers have been using of late. Despite all of the little nit-picks I've had above, the best thing about this kit is still the model. 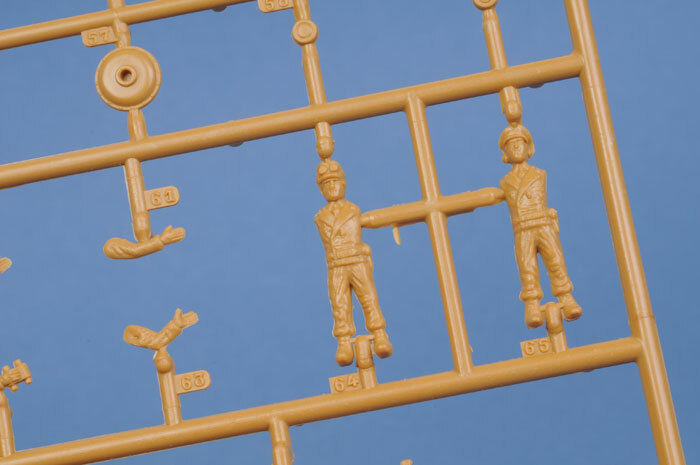 The UM kit may be more detailed and more accurate but this kit built “Out of the Box” will look almost as good and be a lot easier to get and build.